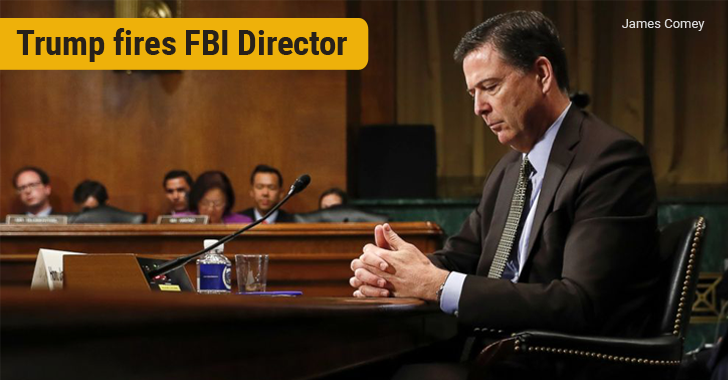 President Donald Trump has abruptly fired James Comey, the director of the Federal Bureau of Investigation (FBI) who was leading an investigation into alleged links between Trump and Russia. The White House announced on Tuesday that Comey was fired on the "clear recommendation" of Deputy Attorney General Rod Rosenstein and Attorney General Jeff Sessions, citing the reason that he was no longer able to lead the bureau effectively. "While I greatly appreciate you informing me, on three separate occasions, that I am not under investigation, I nevertheless concur with the judgment of the Department of Justice that you are not able to effectively lead the Bureau," Trump wrote in a termination letter to Comey. Later a memo from the US deputy attorney general Rod Rosenstein explained that Comey was fired as director of the FBI over mishandling of the inquiry into Hillary Clinton's emails, including his decision to close this investigation without prosecution. However, the memo doesn't mention the FBI investigation into possible links between the Trump campaign and the Russian government. Mr. Comey was delivering a speech in Los Angeles when he learned that Trump had fired him, and initially he thought it was a fairly funny prank. The move stunned Washington and raised suspicions among Democrats, who called it a "Nixonian" move by the Trump. Democrats quickly suggested that Comey's firing may have more to do with 'investigation into Trump's ties with Russia' than with the Hillary email scandal. Last Wednesday, Comey testified before Congress about Russia's role in influencing the 2016 U.S. presidential election. Tim Kaine, Senator from Virginia and former Democratic vice presidential nominee, made a series of tweets, saying the Comey's termination proved "how frightened the Admin is over Russia investigation," arguing that the firing was "part of a growing pattern by White House to cover-up the truth." "The independence of the FBI director is meant to ensure that the president does not operate above the law. For President Trump to fire the man responsible for investigating his own campaign’s ties to the Russians imperils that fundamental principle. Regardless of how one judges the performance of James Comey in either the Hillary Clinton or Russia investigations, President Trump's dismissal of a sitting FBI director raises serious alarm bells for our system of checks and balances." Meanwhile, Senator Minority Leader Chuck Schumer called for an independent investigator to take over the Russia probe. Even NSA whistleblower Edward Snowden condemn the termination despite Comey "has sought for years to jail me on account of my political activities," he tweeted. "Set politics aside: every American should condemn such political interference in the bureau's work" — Edward Snowden. Trump has appointed FBI Deputy Director Andrew McCabe to serve as an interim director unless they get someone to replace Comey, who was serving the FBI from last 27 years and appointed to the director's position by President Barack Obama in 2013.